Your DAILY VOTE can help us win $1,000! We’ve been nominated for the Making the Greater Good Even Greater campaign! To honor community service, Mill City Credit Union will donate $1,000 to one local non-profit. The winner will also have a chance to be featured in the Mill City Credit Union publications. 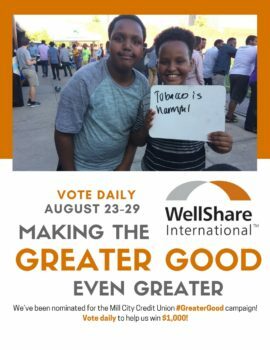 Starting Wednesday, August 23 through Tuesday, August 29, you can help WellShare win by visiting the Mill City Credit Union’s Facebook voting page daily and clicking VOTE. In order to win, we need your votes! There’s never been an easier way to show your support–go to the Mill City’s Facebook voting page once a day and vote! Take 2 minutes out of your week to help us win; every donation is vital to our mission of reducing health disparities throughout the world. Read more about the campaign to support our community and share with your friends why you’re voting for WellShare. We thank you in advance for your continued support. Your vote is greatly appreciated!